Only three people in the house eat this dish. I don't know why the rest of our household don't eat this dish, because it's delicious. And healthy too. I always feel virtuous when I eat this with brown rice. Ampalaya, or Bitter Melon, gets a bad rap because -- well, it's supposedly bitter -- but it isn't really that bitter. 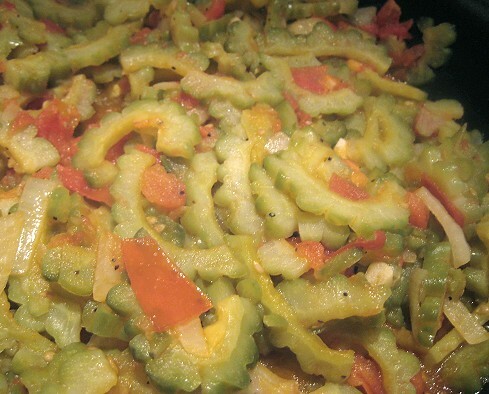 A lot of the bitterness can be blanched away, for example, and our mother cooks the bitter melon first in boiling water for a couple of minutes, sprinkles salt over them, and then rinses the bittermelon slices with water. Personally, I like my bitter melon to have a touch of that bitterness, because it will need it to balance the other elements of this dish. After doing the blanching-salting process, sauté garlic, onions, and chopped shrimp in hot oil, then add seeded and chopped tomatoes. The shrimp are optional. 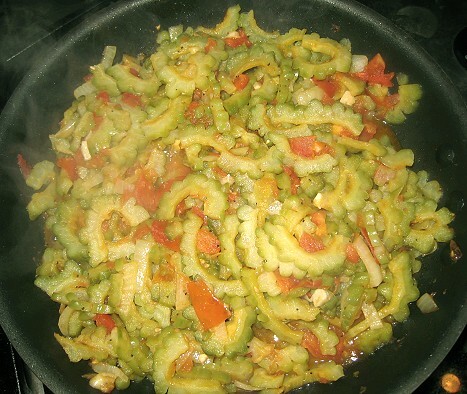 However, our Mama-style vegetable dishes usually have shrimp in them for sweetness. Next, add the bitter melon slices back into the skillet and cook until tender. Beat a couple of eggs and stir them into the skillet with the bitter melon. Season with salt and pepper. If you find the bitter melon still too bitter for your taste, add a touch of sugar to balance. You can omit the eggs if you wish. Here's the dish, pre-egg. If you'd like to participate, see who's hosting next week. 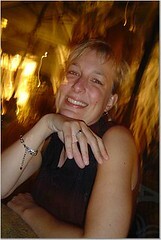 WHB is hosted this week by Ulrike of Kuchenlatein. Ooo I totally love this dish... bitter melon is an acquired taste for me ... I don't dare to eat it when I was young but now I really enjoy it! I actually love bitter melon. Bitter melon? Hmmm - I've never heard of that one. 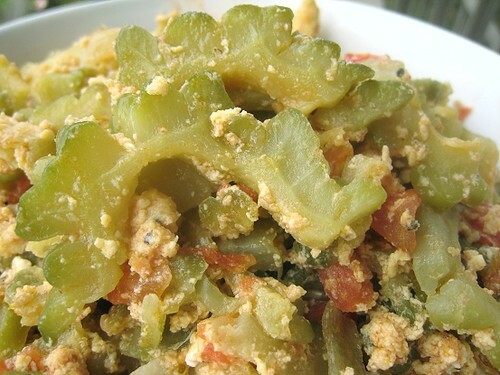 I love ampalaya with eggs, my favorite! This looks wonderful - I can't understand why no one else eats it! I've never tried bitter melon but I've been wanting to... This makes a great excuse. My friend's trick...she skips the blanching step (the process squeezes out all the vitamins and good stuff from ampalaya)but slices the ampalaya as thinly as possible. Also, she stops stirring the dish after the ampalaya has been added. I have never had bitter melon... I'll have to try it sometime. I've never tried bitter melon, but a friend of mine sampled it once at the farmers market. He didn't have the best reaction, but maybe if he tried it in this dish, he would love it! I have not had bitter melon; it certainly looks interesting. I will have to keep and eye out for it to try. I love this, it's so unique too. I have never heard of this melon so I feel I learned something new! I could kiss you! I have been looking for a bitter melon recipe for ages, my husband adores it! Thanks so much! My grandma makes it exactly like this. I've seen bitter melon at so many farmer's markets but had no idea what to do with it. This looks fantastic ladies! This is the only dish I don't dare to eat.I try once when I was young but never touch again..Maybe I should try again since everybody said it's healthy!! I can't believe that I hated this as a child, but crave for it over a computer screen now. This looks exactly how my mom made it. I don't like bitter melon but your dish looks good enough to make me want to eat it. I should make it. My doctor told me bitter melon helps to lower the blood pressure. We were actually thinking not to post this because we thought it was too "common" -- that is, it was an "everyday dish"... something like that. But we're glad we did post it after all! I still don't really eat bitter melon because, you know,bitter! Teehee... I think when I get older, hahaha. To whomever wants to try: Bitter melons should be available in Asian produce stores/supermarkets. They're green and "crinkly". We should've taken a picture of them raw. We should try that trick. Ooooh. Maybe *I* will eat it if it's done in such a savory way! We've only ever had it this way, with the tomatoes & eggs. Hmmm. Now you give me pause. ohhh yum!! my parents grow bittermelon and she sent me home with some on my last visit! my husband had never had it before (white boy from michigan!) i made it how my grandmother taught me (scrambled with eggs) and he actually loved it! Bitter melons are new to me but I do like the shape of those slices, cute! In my old age ;-) I like bittermelon...but not too bitter. I choose the younger ones with smoother skin - not so crinkly. Then thinly slice and salt first (we skip the blanching step...hmm, maybe that would help if we blanched it in sugar water?). Did you know you can make a tea out of bittermelon leaves? supposed to be good for diabetics. Oh, maybe we'll try it with patis. Since I don't eat it, I don't cook it. Haha. So we always get the Mama-style version. We've seen "karela" around too but weren't sure if it was related to bitter melon! The ones labeled karela are usually much smaller than the "bitter melon" we see. Strange, eh? Yeah, it's supposed to be good for you in all sorts of ways. I don't think I've seen them with their leaves, though. In the stores, that is. Very interesting! One of the big stores in Salt Lake just re-designed the produce section and I noticed recently they had this plant. I've been very curious about it so now I have a chance to try some. I like some bitter foods, so I'm thinking I will like it. Love this. Brings back good memories of the Hong Kong kitchen I used to lunch at when working on Wall Street. Hold the sugar, though. The bitter is just right. I love ampalaya too! In fact, I just became a fan of it in Facebook! i love your posts! just visited your site and im really impressed with the dishes. be adding this to my favorite sites. Half Visayan, half Caviteno Tagalog here from Las Pinas City, based in Cebu City, wife's Kapampangan.